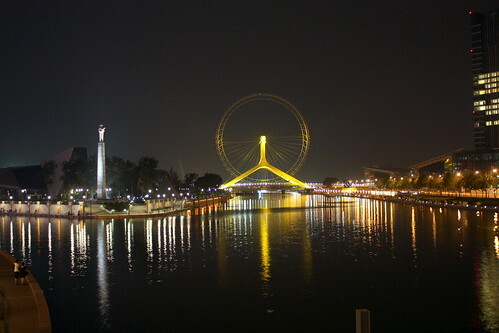 Tianjin Eye is a 120m-tall (110m-diameter) Ferris wheel built on the Yongle Bridge over the Hai River in Tianjin, China. 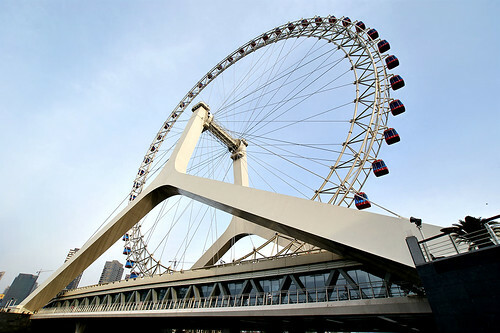 Though smaller than London Eye (135 metres), Star of Nanchang (160 metres) and Singapore Flyer (165 metres) it is unique in the sense that is the only Ferris wheel which has been placed over a bridge. It was opened to the public in April 2008, has 48 capsules each with a capacity of 8 passengers and takes about 30 minutes to complete a rotation. Note: Present GE imagery being old shows the bridge under construction and doesn't show the Ferris wheel. What a nice pics! I love observation wheels, it is fantastic overview from the height. I was with my husband in the London's wheel. It took us much more than 30 minutes tour.